One of the key objectives of the Psalter Hymnal Resource Library is to collect as many audio recordings of the Psalter Hymnal as possible into an easily-accessible database. The main way we accomplish this is through the Library Tables, which contain links to audio and/or video recordings for each selection in the songbook. However, you may also be interested to know that complete albums of Psalter Hymnal songs do exist and are usually quite available online or on CD, often through the work of URC Psalmody. In fact, we’d like to take this opportunity to give you a little walk-through of this section of the library. This Dordt College album series remains probably the best and most complete source of Psalter Hymnal recordings available today. As the cover notes explain, “This recording is the first of a series which will eventually result in a collection of one of each of the psalms in the Psalter Hymnal. Each Psalm will be arranged primarily for either instruments or voices, but the instrumental Psalms will contain at least one stanza which will be sung. The performers will be singers and instrumentalists from the Dordt College Music Department. 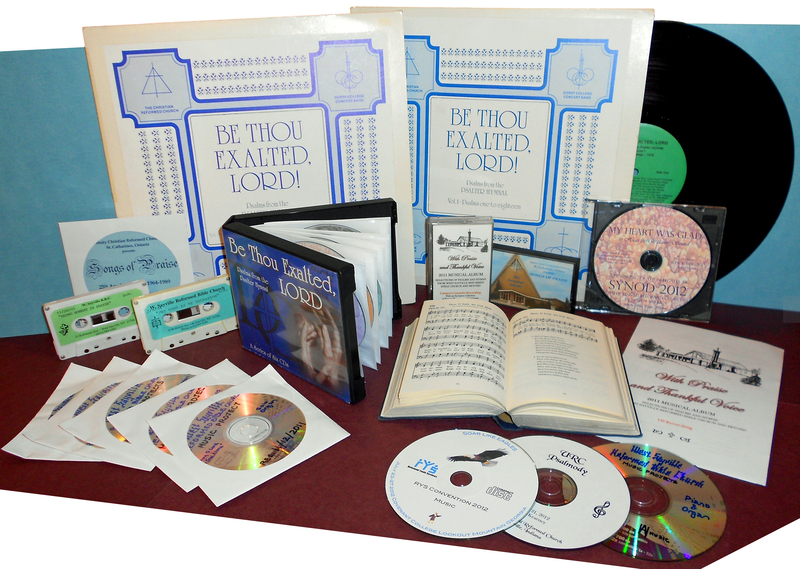 It is hoped that one or two records can be produced each year until all one-hundred-fifty Psalms have been recorded.” Under the skilled leadership of Dale Grotenhuis and others, this goal was accomplished: nine LP’s were recorded between 1978 and 1986. While each psalm usually receives only one setting (leaving about half of the Psalter Hymnal’s psalm-songs untouched), the arrangements are excellent—a pleasure for everyday listening as well as careful study. In more recent years, Be Thou Exalted, LORD has been re-released in a six-compact-disc set. It’s a valuable addition to any church musician’s library. Be Thou Exalted, LORD is available from a variety of sources. Reformed Fellowship, Inc., currently has the lowest price. (Under “Catalogs” on the left-hand side of the page, you should see a “Psalter Hymnals” category. Click this and you should find the “Be Thou Exalted, Lord” item in the list.) For slightly more, the set is also available from the Westminster Seminary California bookstore. Or you can obtain it directly from the Dordt College bookstore or Dordt’s KDCR radio station (audio samples are available at this link). Songs of Praise was initially released as a cassette commemorating the 25th anniversary of Trinity Christian Reformed Church (now URCNA) in St. Catharines, Ontario. With masterful accompaniment from Christiaan Teeuwsen on organ and Stuart Laughton on trumpet, this album includes several stirring renditions of psalms and hymns from both blue and gray Psalter Hymnals, as well as a healthy dose of Baroque processionals. Even the congregation’s children shine in their renditions of “Remember Not, O God” (Psalm 79) and “Teach Me, O Lord, Thy Way of Truth” (Psalm 119). A wonderful collection! Just recently, URC Psalmody obtained permission to re-release Songs of Praise on CD. For now, it’s not publicly available, but feel free to contact us to investigate the possibility of obtaining a copy. Nevertheless, the entire album is available right now on URC Psalmody’s YouTube channel! 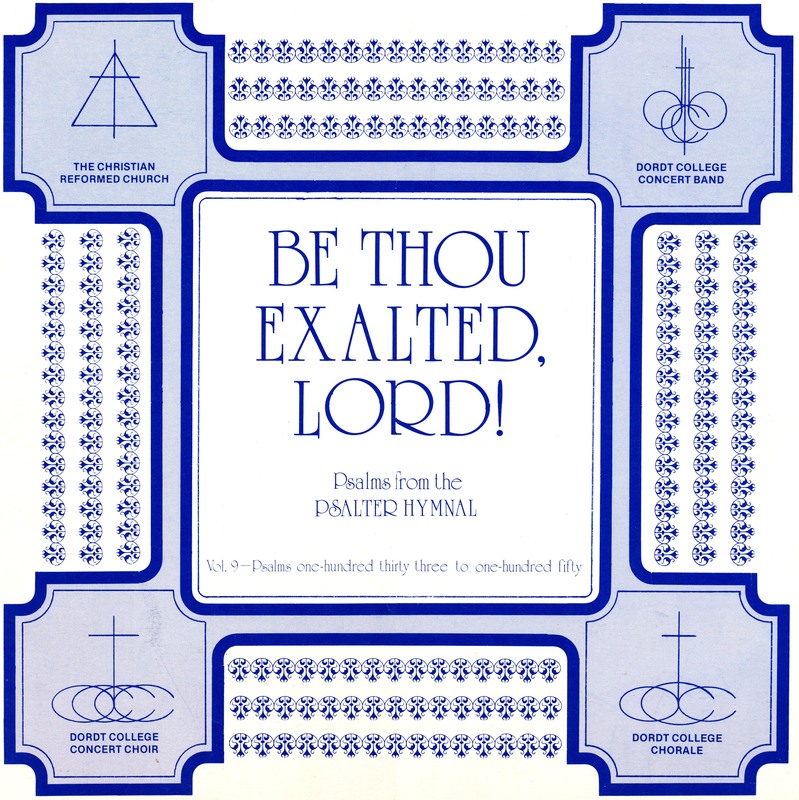 Recordings of ordinary congregational singing and homemade arrangements of Psalter Hymnal psalms and hymns combine to form this “first formal collection of music from West Sayville Reformed Bible Church” (URCNA). The 23-track CD contains contributions from the church choir as well as piano, organ, flute, trumpet, clarinet, and even saxophone, along with special recordings from a classis meeting and the 2011 Reformed Youth Services convention. While the performances are far from perfect and the sound quality far from professional, this album may serve as an encouragement to anyone eager to improve the music of the local church. A welcome sound indeed it is to hear 250 men singing heartfelt praise to God from the Psalter Hymnal. 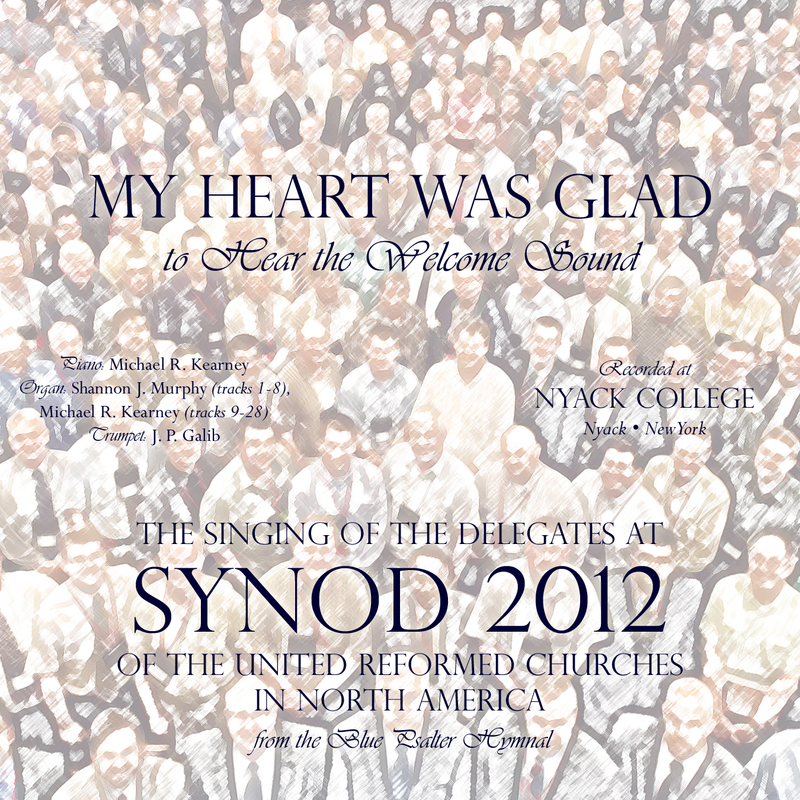 This collection of songs was recorded at Synod 2012 of the United Reformed Churches in North America, with the accompaniment of Michael Kearney on piano, Shannon Murphy on organ, and J. P. Galib on trumpet. Despite its sometimes subprime sound quality, My Heart Was Glad serves as a harbinger of heaven, and for a self-produced album, it seems to be in surprisingly high demand. 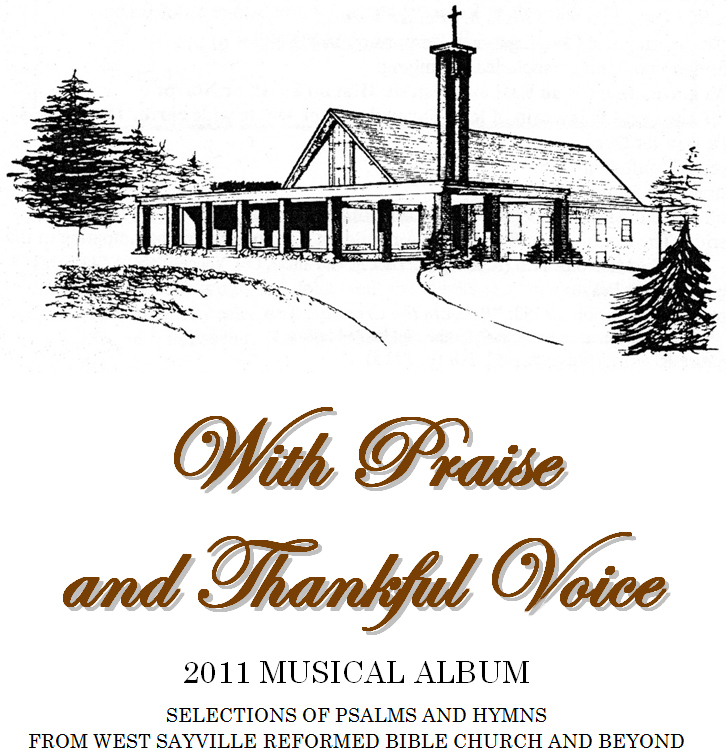 Pompton Plains Reformed Bible Church (URCNA) is responsible for the production of this CD and, as of January 2014, is still offering copies for a suggested donation of $4.50 (US) or $5.00 (Can). The entire album is also available on URC Psalmody’s YouTube channel. For more information visit this URC Psalmody page.